Exiles Annual #3 Cover Art. 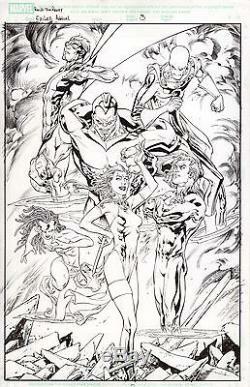 Original pencils by Tom Raney. Original inks by Scott Hanna. Condition: Beautiful piece with no apparent major flaws. The item "EXILES Annual 3 Original Comic Cover Art TOM RANEY SCOTT HANNA X-men Blink Xmen" is in sale since Friday, June 02, 2017. This item is in the category "Collectibles\Comics\Original Comic Art\Covers". The seller is "aspen_matthews" and is located in Fairfield, California.